A few months ago I was wandering the internet (as you do) when I saw an extremely gorgeous book cover and title combination, and stopped in my tracks. That book was Margaret Rogerson’s An Enchantment of Ravens. I read the description and didn’t immediately think “must have it now!” to myself, but I did swoon a bit longer over the cover art before going on my merry way. And then… [cue dramatic music] I kept seeing it pop up, usually with the very highest recommendation. Like, it got to a point where I was pretty sure every book person on the interwebs whose opinion I trust had LOVED it. I knew I had to have it, and then when I got it I loved it EVEN MORE THAN EXPECTED. Ughhh good book is SO good! Friends, I read it twice in one weekend and had to put it IN THE BOOKCASE so as to not keep rereading it every time it caught my eye. It is absolutely charming. 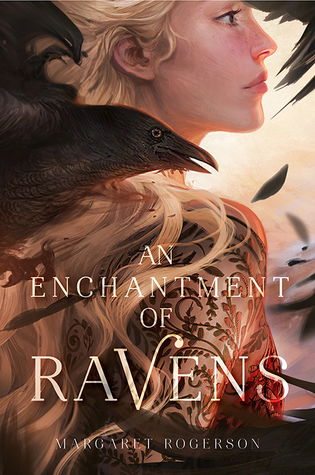 An Enchantment of Ravens is seventeen-year-old portraitist Isobel's story. She lives in the never-changing summer of Whimsy, and her clients are dangerous, inhuman fair folk. The folk crave Craft, or human creations, and none so much as Isobel’s masterworks. When she makes an unforgivable mistake by painting human sorrow in the eyes of the autumn prince, Rook, she must risk all that she is to survive. How fast did I fall in love with this book? By page two! I knew there was a spark of something on page one, when we’re introduced to a fae named Gadfly, who is having his portrait painted while wearing yellow. That’s it, that’s all it took. What can I say, I swoon for allusions and hidden meanings and even if the author didn’t intend it I was picking up something – something charming and lovely and playful. And then on page two, I knew I was 100% in love when Isobel thinks to herself, “Rudeness was not an affordable mistake.” There’s dry humor here, I thought, and I was hooked. Another reason I found the book so enjoyable was the absolute drama of the fair folk, and especially Rook. He's a wizard Howl (of Howl’s Moving Castle) -level diva and kind of adorable. If you’re not convinced yet, I’ll spoil you very gently by saying this is a “the heroine saves herself” sort of story, and the best kind, at that. In addition to infusing humor and evoking the danger inherent in the fairy realms, Rogerson excels depicting the art of painting, creating relatable (human) family dynamics, and describing the natural world and season-specific foliage in lush details. TL; DR it is a beautifully written book as well as a fun one! How much did I want and like this book? I stalked my local bookstore last week to pick up an early copy. I canceled my online preorder and went in person and bought it as soon as I could, because I was pretty sure it was going to wreck me (in a good way). Like I was so excited for this book that I couldn’t wait an extra few days until official release day THIRSTY. And it was all warranted. In all, Rogerson’s debut is a thoroughly delightful take on fairies, and a must-read for young adult fantasy fans. Recommended for: fans of Diana Wynne Jones, young adult fantasy in general, and any reader who imagines themselves as a smart and capable hero/heroine in their own adventure. Oh Cecelia, you know that the way to my heart is by comparing anything to Diana Wynne Jones. I'm in!